Cary Grant could have had chemistry with a dead plant. Nineteen thirty-seven’s The Awful Truth showcases the man’s ability to play deadpan earnest while playing aloof goofball. The balance is impeccable and its allows all the characters involved to shine in their respective roles. This combination of traits works well for romantic comedy; it plays foil for a lover spurned and a more straight-edge love interest. The combo is pliable, too. It allows this character to jump from alpha to beta depending on the direction plot dictates. Because the traits are so pervasive, flexible, non-conformist, what does it matter that Irene Dunne wasn’t simply a fern stuck to the wall? Because the last and most precarious variable is the combination of time and place. Grant afforded himself a niche that continues to cut across time. His accent placed him from San Francisco through Gary down to Raleigh and up to New York. The virtue of black-and-white photography is that it allows only for a limited range of saturation and hue, while brightness is relatively fixed between the binary of zero (black) to one (bright); this is what adds a layer of complementary guffaw to the opening scene, wherein Grant, as innocuous but conveniently wealthy Jerry Warriner is asked about his “suntanning.” In order to show this effect, perhaps his skin-tone did deepen – but it is almost impossible to tell. Could Grant, as Jerry, have conveyed aloofness in another manner and in another time? Probably, but it makes its more conducive to a 90 minute slice to have all the parts functioning at a high level, with a clear start and end to the thought process. The Awful Truth is the 1937 equivalent of the points in film form. Cary Grant is the catalyst that makes this movie tick. That said, is there something for us readers to learn from Grant’s performance, or from The Awful Truth in general? The outward lesson is that the man who is wrong eventually learns so. Another lesson is that true love will find us in the end, right? This movie allows us to explore and vacate notions of intermediate partners for the concept monogamy, holding the intermediate partners as caricatures. This part isn’t necessarily some sort of proxy: in between – the learning phase – the strong relationship building not everyone meets a simple Midwesterner and or a sexually ambiguous “piano teacher” or a debutante-heiress (holding gender and orientation equally ambiguous – remember 1937 was directly in the era of most hushes as decreed by Mister Hays). For archetypal reasons, the path from point A to point…A, is simpler this way, but as students of life, we know that this is just not true. Understanding this margin allows us to separate film from reality and understand, that at the end of the film, regardless of how charismatic we (I) think we (I) am (are), I’ll never be as charismatic as Cary Grant, at this time and this place, even if my partner isn’t a philodendron. As we’ve seen (and different from my 1948 posts, where I worked from nominees through the eventual winner), The Life of Emile Zola won for its gravitas and execution – and most likely because it represented some sort of gestalt/zeitgeist performance of an overall mood or what the Academy might have forethought future might want to have remembered about 1937. 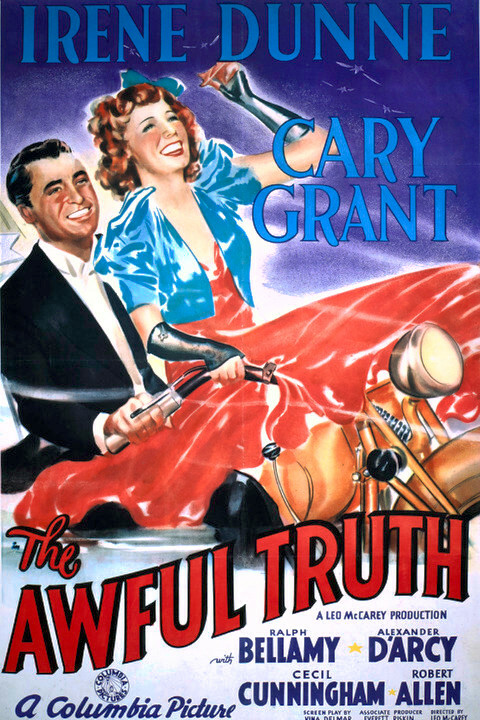 The Awful Truth is more of a fun film, a family film from the pre-forties, certainly representative of a serialized relationship that the serialized film industry wanted us to believe, with Cary Grant front and center.